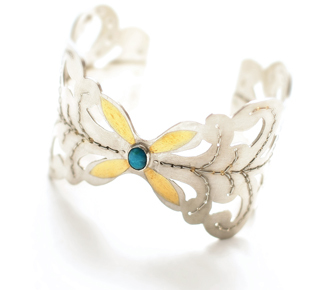 Stitched Cuff Bracelet, by Vancouver, BC, Jewellery Artist, Simone Richmond. Baroque lace and the tradition of hand stitching. I love the delicacy of lace and use it as inspiration as much as I can in my work. I channeled my childhood memories of learning how to hand sew from my grandmother when it came to the stitching. I used sterling silver for the base, fine silver wire, 24kt gold keumboo and the stone is chrysocolla. What was the most challenging part of making this piece? The stitching was the biggest challenge since I used fine silver wire since it was the most malleable. I had to sew it in small stages and slowly since the wire easily breaks. Once that was finished, I needed to craft a way that made the cuff wearable without the stitches scratching the skin. If you could create the perfect event, where would you wear this piece? I think it would be super fun to wear it with a simple summer dress and heels to an outdoor evening garden party.